Today, messaging has become an important part of our life, and we send tons of texts every day and most of us have our own favorite messaging apps, and there are quite a lot of them in the market right now. Messaging apps now offer the traditional text messaging option and they also function like social networking app. Messaging apps now enable you to expand out of the traditional one-on-one texting, and they have real frequent updates and allows you to have group chat and there are options to even share audio, files, videos and a lot more. Today, we’re going to take a look at a Kik Messenger, which is a really good messaging app which has become one of the most popular messaging apps ever in the iOS Apps list for the Apple devices like the Apple iPhone, iPad and the iPod Touch. Kik messenger has introduced some new changes when it comes to messaging apps, and one of the most prominent features being able to share pictures, YouTube and even sketches and that’s something really unique. 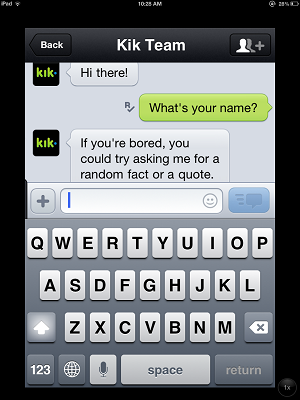 This app developed by KIK INTERACTIVE INC. seems to be growing in popularity nowadays as it just reached the 50 million users milestone. 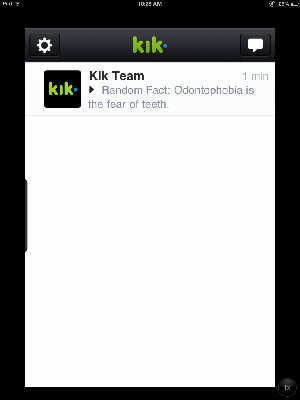 The users of Kik can make the most out of this app by downloading some other apps which could be used on Kik such as sketchpad, video etc. Kik Messenger supports a range of languages such as English, Arabic, German, French, Chinese, Korean, Japanese, Italian, Portuguese and more. The app is really user friendly and seem to have a range of features that other messaging apps seem to be missing. The app offers both portrait and landscape modes. Another interesting thing in this app is that whenever you send a message, it acknowledges it by displaying an “S” and also when the message has been delivered it shows a “D”. This messaging app also allows you to send photos directly through the app, which means you no longer need any other thing to send photos, just go into Kik and select the photos and send. Another highlight seems to be the range of emoticons offered by the app, which is in plenty. As already pointed out, you can also make use of the YouTube videos, sketch feature and capture sharing. The brilliant developers of this app have enabled access across all the platforms, which is needless to say, Amazing. You also get to know when your friend has read your message, just like messaging on Facebook. One of the best things reported about this messenger from the different users is that it doesn’t get stuck, and works perfectly in the older versions of the Apple iPhone, including the iPhone 3GS, thus has become one of the best apps around. 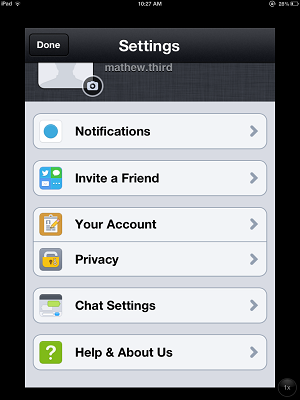 Other similar apps: Some of the similar apps which would do a good job in the messaging and chat, include the IMO Messenger app, the Tap to Chat Google Talk Client.